HOT PICKS EXTRA: Alan Moore and Tyler Durden. You Want More? Home » HOT PICKS! » HOT PICKS EXTRA: Alan Moore and Tyler Durden. You Want More? Man…. This is a pretty amazing week. Last week of Convergence, more Secret Wars tie-ins, a brand new Alan Moore series and Fight Club! Cards on the table: If I had the courage of my convictions, I would not be stocking Convergence and Secret Wars on our shelves, just for hold customers. It’s not a judgment on the events or the companies doing those (I’ll save those for later) but a pure matter of SPACE — there are over a hundred books a week and with DC and Marvel trying to put out about a dozen “event” books every week, it’s just ludicrous. That said, there are three Marvel Secret Wars books this week I’m looking forward to: Where Monsters Dwell #1 piqued my interest with the title, but having Garth Ennis writing wins me over. Likewise, Secret Wars 2099 #1 intrigued me, but when I saw it was Peter David at the helm (and that their Hawkeye is ACTUALLY a HAWK-GUY) I was in. I’m not just a writer chaser, though — I have characters I enjoy too. And MODOK is one of them! 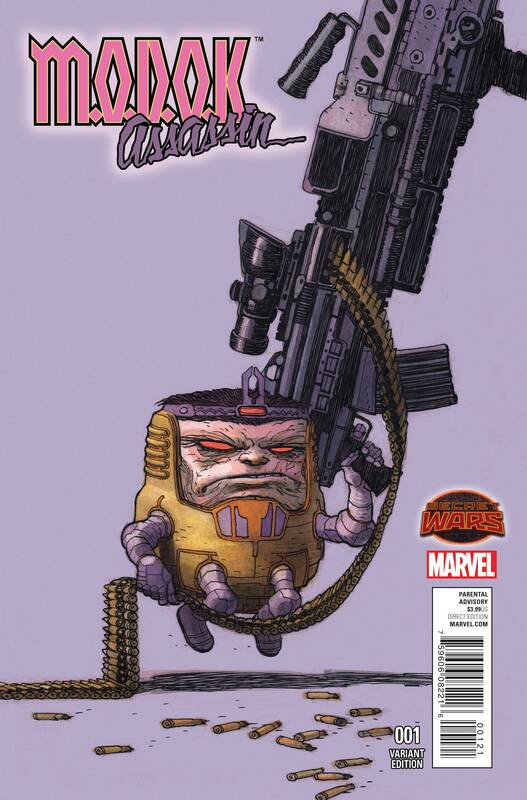 Kinda excited to see if MODOK Assassin #1 is as awesome as his recent incarnation in Ales Kot’s Secret Avengers. 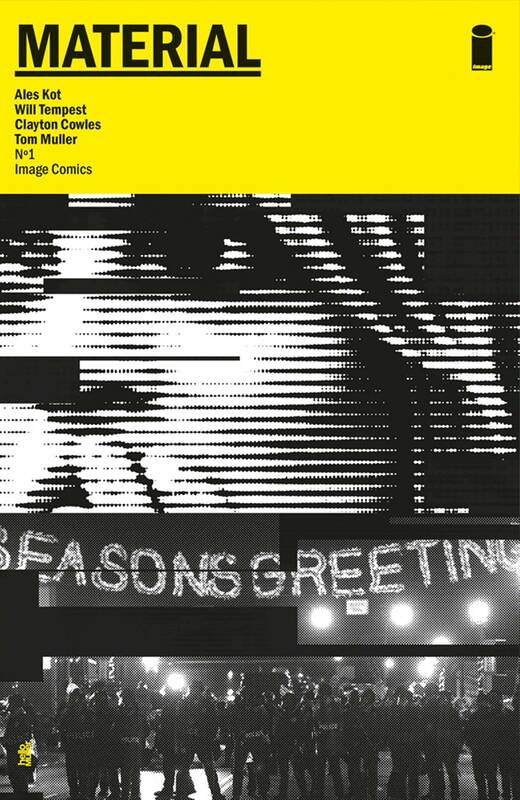 Speaking of Ales Kot, the next book by this “hot young writer” is out this week from Image. The Material is a book Kot will NOT shut up about. He tweeted that he did five podcasts in a row one night just to promote it. It’s always wonderful to see a creator this genuinely excited for his new work. Here’s hoping that this week’s debut will get people as excited as he is. Now, when it comes to self-promotion, the current monarch in comics is Alex De Campi and she has a new storyline starting in Grindhouse: Drive In Bleed Out #5. This time, she is tackling the Blaxploitation genre with a two-part story called Lady Danger: Agent of B.O.O.T.I. Part 1: SUPERFLY SUPER SPY. How can you say no to that?! Another book that’s going to be hard to resist is a fund raiser for the Comic Book Legal Defense Fund. In CBLDF Presents Elephantine Shots #1 (Image) Richard Starking and a cavalcade of superstar artists (Tim Sale, Shaky Kane, Dave Sim and more!) present all those stand-alone Elephantmen strips that have appeared in anthologies and fundraisers. A great book of awesome art that will, hopefully, provide introduction into one of the most underrated series out there right now. The two “hottest” #1s this week, though, are clearly Fight Club 2 (Dark Horse) and Providence (Avatar). Now, I have to make a confession- Chuck Palahniuk’s Fight Club is a VERY VERY VERY important book to me. The movie blew my mind, the book put back together in a new shape. I actually used to have an essay up on the official Palahniuk site about his first three books, written when I was 17. While the last few works of his haven’t done much for me, Palahniuk still stands in my personal pantheon as an author who has shaped me. That ALL being said, I was very trepidatious about this comic sequel, even with the great David Mack involved. But everything I have seen of this book looks excellent. It seems reminiscent of Brett Easton Ellis’ Lunar Park, a book that explores the author’s own work through the lens of the post-9/11 world. 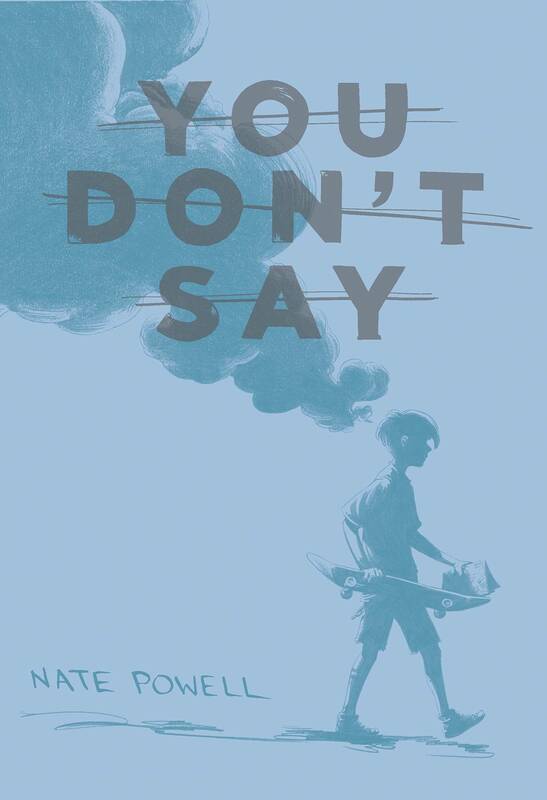 While I imagine there is a lot more going on in this book (as there was in Lunar Park) I think that exploring a work that glorified violence and anarchy in a world that has changed its feelings on both quite a few times since Fight Club came out… is a good thing. 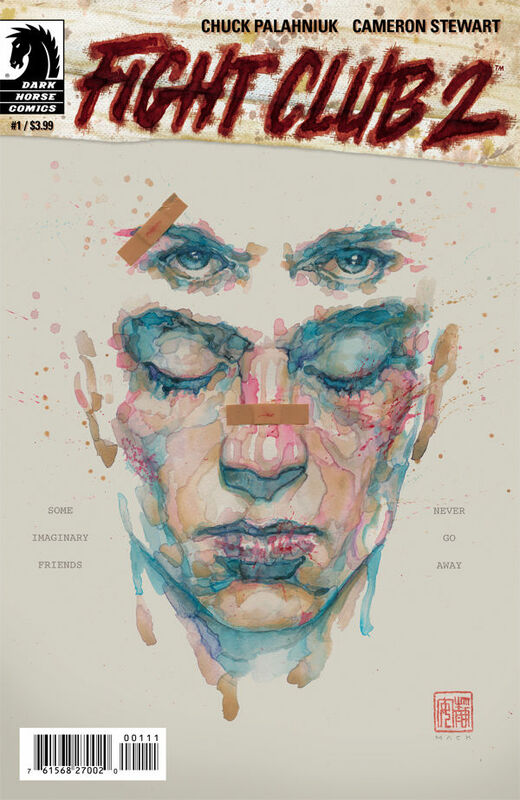 Anyway, Fight Club 2 #1, yeah, you should get it. When discussing writers in my personal pantheon, it’s obvious Alan Moore, of course, holds a spot there. 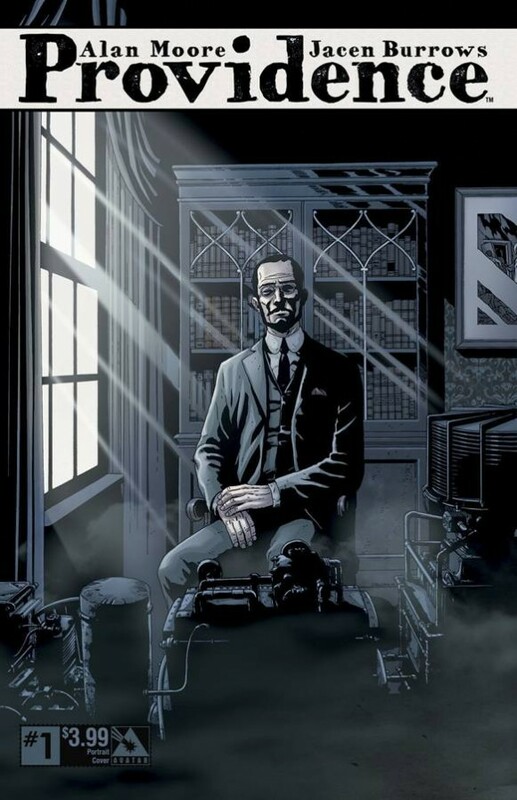 I’m not the biggest fan of what people call his “Lovecraft” work for Avatar Press for a variety of reasons, but this new book, Providence #1, despite being about the same thing, interests me a lot. Why? Well, I’m glad you asked! You see, my favorite Alan Moore book is From Hell, not just because Eddie Campbell is an amazing artist or because the story is so compelling but because Moore uses the Jack the Ripper murders as a chance to explore every aspect of Victorian society. My second favorite Moore is V for Vendetta, because far more than the story about revolt, it’s an exploration of how every aspect of a totalitarian society contributes to and aids the fascists in keeping their positions. You see where I’m going with this? Providence, we are told, is going to explore not just the life and work of HP Lovecraft but the cultural milieu of intolerance, fear, and hate in which he grew up and wrote. So yeah, I’m excited. But where would we be without graphic novels? No, seriously. Can you imagine if comics were still stuck in their infancy, stores just pushing single issues, ridiculous events, and merchandise, while ignoring the long form of the medium? I mean, seriously — can you picture walking into a comic shop and ALL they have are a handful of books; the majority of space not designated for monthly books taken up by superhero posters, statues and toys? Thank G-d comics has outgrown that! Sithrah, Coffee Table Comics. 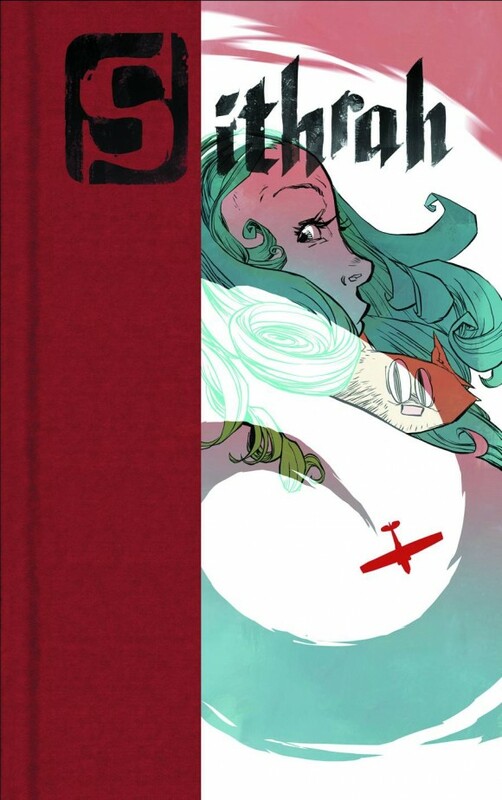 Jason Brubaker has done a lot of different things, but an all-age, part comics/part prose tale about a girl named Nirvana struggling to find her father after a mysterious force crashes the plane they are on is one of his most ambitious. Clearly more than a simple tale, the Buddhism-inspired book could be one of the more satisfying things you read this week. Louise Brooks Detective, NBM. Did I mention unique visions? 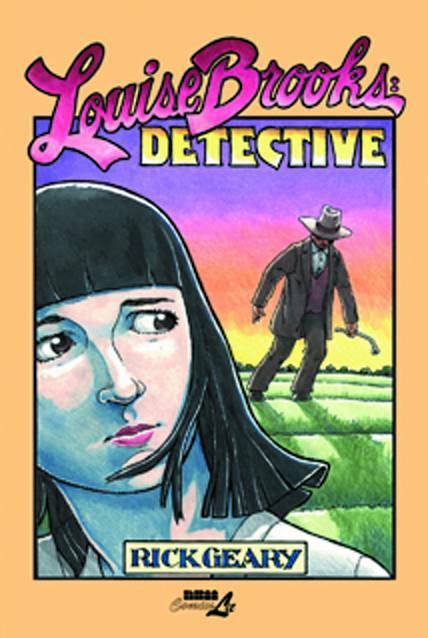 Well, only Rick Geary could envision a world in which famed film star Louise Brooks returns to Wichita after her film success only to be embroiled in a murder mystery more reminiscent of the life of Hercule Poirot than Brooks. It sounds like a crazy idea for a book but Geary is both a master at period comics AND surrealism, so there’s nothing about this book that doesn’t sound positively delightful! 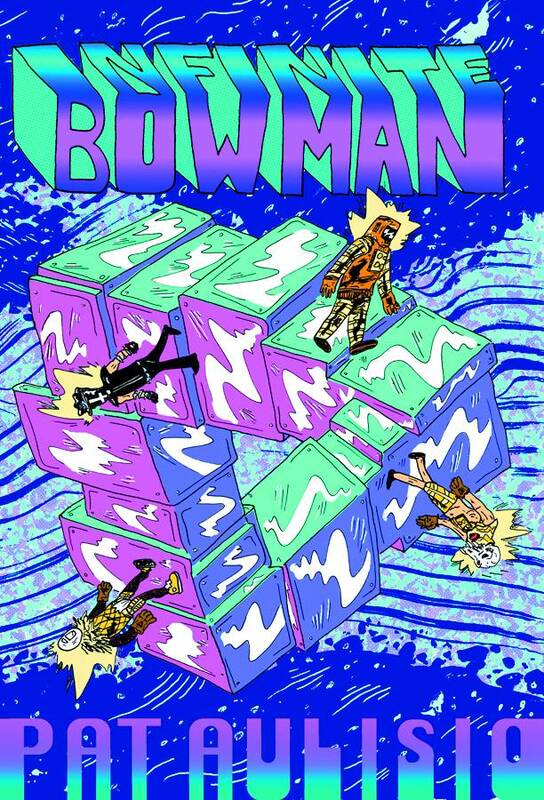 Infinite Bowman, Alternative Comics. Speaking of surreal, Pat Aulisio is another master of that form. While Geary focuses on the bizarre in everyday settings, Aulisio normally likes to place us in otherworldly spaces, where the rules of physics and natural laws are suspended or different. In this book, a lost astronaut wanders through something called “The Wastelands,” cursing his friends and battling demons. Sounds like fun and looks like a real trip! You Don’t Say, IDW/Top Shelf. Nate Powell is one of those comics creators who doesn’t get the credit he deserves. Now, before you start sputtering to yourself about his countless awards and his recent television appearances to promote the March series he draws with Rep. John Lewis, let me clarify. Powell is one of those people whom I almost never hear anyone discussing. His work is liked and respected, he is awarded and rewarded left and right, but no one seems to talk about how powerfully evocative his line is, how intensely personal and emotional his writing is, and how easy he switches between any color on the emotional spectrum in the course of just a single page. If you don’t know what I’m talking about, you need to pick up this collection of the last nine years of Powell’s shorter work. And if you do know what I’m talking about well, you were already going to buy it.